Authentic Military "Money" from the Vietnam War! When American soldiers began arriving in Vietnam in the 1960s, they needed money – cold hard cash for things like soda, cigarettes, beer, and other essentials. The base PX had all that – and more. But using U.S. currency at military establishments was out of the question thanks to the threat of black market trading and counterfeiting being far too great. 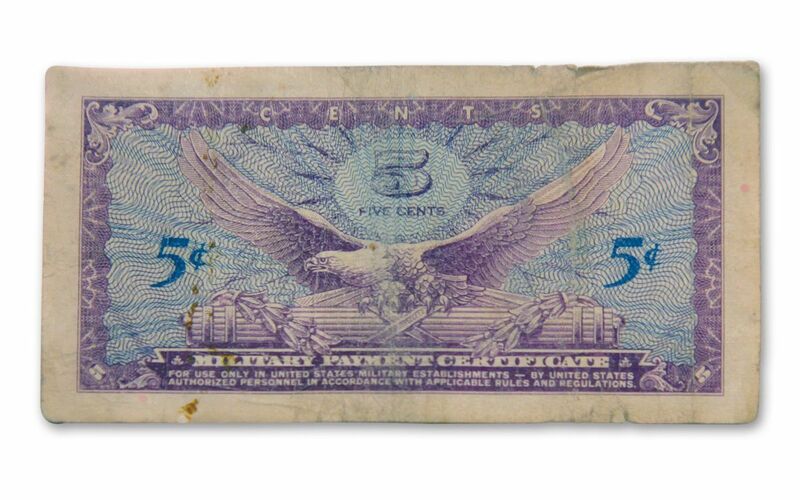 Instead, between August 31, 1965 and October 21, 1968, U.S. troops were issued a variety of Military Payment Certificates (MPC) from the Series 641 issue. 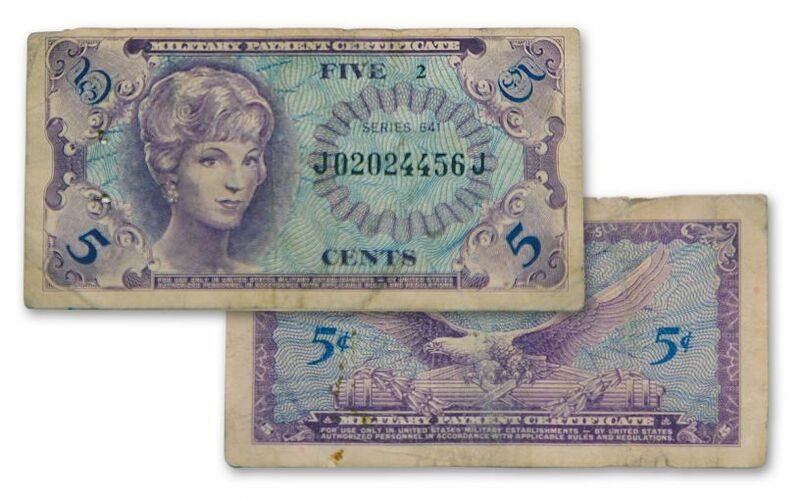 Unlike standard U.S. currency, these notes were issued only to soldiers serving overseas, and were created to be tightly controlled and demonetized at a moment’s notice. 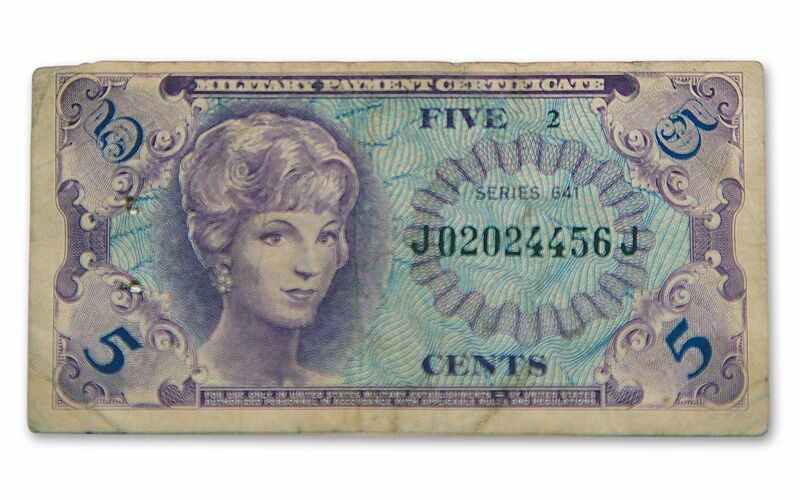 The first military note series ever issued in Vietnam included Five Cent, Ten Cent, Twenty-Five Cent, Fifty Cent, One Dollar, Five Dollar and Ten Dollar certificates. Each circulated for only a short period of time, and most were destroyed – but not all! Now, after more than 50 years, we’ve managed to acquire a small number of authentic 1965-1968 MPC 5-Cents notes in Lightly Circulated condition! It took some doing, too. As anyone who has served overseas knows, GIs were forbidden from using MPC notes off base. But when they discovered they could exchange MPC notes for several times their value with local merchants, many GIs fell victim to temptation – they’d even have relatives send cash from home, convert it to MPC notes and then make a killing in local trade! To flush out the worst offenders and their black market partners, the Brass would periodically carry out sudden cancellations of existing MPC currency, replacing it with new issues. When C-Day (Conversion Day) arrived unannounced, troops were confined to base to prevent contact with the locals. Neither soldiers nor the locals wanted to get stuck with worthless money, creating an incentive not to hoard these notes. Once exchanged, the old notes were destroyed. Thus, typical survival rates don’t apply to military payment certificates like it does to other currency. Something printed relatively recently and in high numbers could actually be very rare because most would have been destroyed on Conversion Day. The black marketers didn’t always take this lying down; it was not uncommon for the nearest U.S. base to be attacked in retaliation soon after C-Day. MPC currency notes were first used following WWII to help local currencies. During the war, American GIs discovered that they could use U.S. dollars for less than the accepted conversion rate, a scheme that helped spawn a sprawling black market network. To combat this, the U.S. military introduced the MPC program. Unlike U.S. currency, these notes were issued by the Department of Defense NOT the Treasury Department. Today, MPC notes are among the most popular forms of paper currency desired by collectors. Whether you remember spending them during your tour in Vietnam or just want to add a genuine piece of U.S. military history to your currency collection, don’t miss this opportunity. Don’t wait; secure your 1965-1968 Vietnam Series 641 MPC 5-Cents Note today!